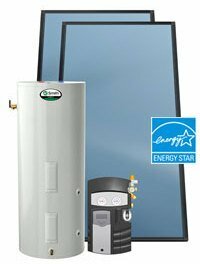 How manufacturer of AO Smith solar water heaters can help you save money on water heating by using the "green" technology. Explore the main features and advantages of the AO Smith active solar water heating. AO Smith solar and its Cirrex system is a system that uses a solar-free energy for residential water heating. These active solar heaters come with the 16 different options and several collector configurations making it great for a variety of applications and demanding market. With the high solar energy factor of 10.1, Cirrex solar can provide up to 70% of the energy needed for heating the potable water. AO Smith solar water heater, such as the one from the picture above, consists of the flat solar panel, solar booster tank with the heat exchanger, fluid lines, and a solar pump. As there is no contact of the heat transfer fluid and potable water, this system is called a closed-loop system. The booster tank is actually a water storage tank that is available in capacities from 65 to 120 gallons and is equipped with the two 4500 W heating elements for the backup heating, dip tube, anode rod and other useful features. The heat exchanger is available as the single or double wall and is immersed inside the water tank, where the heat will be transferred from the solar heat fluid to potable water stored inside the storage tank. The heat transfer fluid is usually a mixture of distilled water and propylene glycol (to prevent freezing) that is heated in the solar panels and transferred by the pump through the piping and the solar booster tank. Cirrex SUNX and SUN are recommended booster tanks for AO Smit solar WH systems and are used to store hot water during the indirect or direct water heating. Direct solar booster tanks are available in three sizes; 65, 80 and 119 gallons and they do not include the heat exchanger, while the indirect models come with the capacities of 76 and 108 gallons and have the same recovery rate of 21 GPH as the direct type. Solar collectors are flat black-painted panels that absorb the sun's heat energy and heat the inner transfer fluid which is after transferred to the booster tank where it heats water. The panels are made of the high-quality materials and are installed using the advanced technology such as the laser welding, which ensures longer life, better performance and years of trouble-free service. Glazing utilizes the low-iron patterned and tempered glass with the anti-glare surface and 91% solar transmittance. The casing is made of the lightweight aluminum painted in black and anodized for easier installation, better absorption and protection. There are no screws, which may become loose over the years; the casing is using the interlocking mechanism. The absorber plate is the aluminum sheet with the selective black coating which allows more than 90% solar heat absorption. The panels are using the three-layer insulation that consists of the glass wool, polyurethane foam and aluminum foil, so it helps to retain the captured heat longer. The panels are backed up by the 10-year warranty. CR-110-AP – collector area is 25.5 sq. ft.
CR-130-AP – collector area is 32 sq. ft.
CR-140-AP – collector area is 40 sq. ft. The solar panels are available in one, two and three-collector configuration. For the highest efficiency and best performance, it is recommended to dimension the system properly, locate and orientate the solar panels with the ideal exposure to the sun. Solar pump station controls the flow of the heat transfer fluid from the panels to the storage tank. There are two types of the circulation pumps used in AO Smith solar water heaters; standard type and double wall. Standard type is mainly used for the indirect solar booster tanks with a single-wall heat exchanger, while the double-wall pump station is used with direct solar booster tanks and double wall heat exchangers, and it utilizes two circulation pumps. Both pump stations feature a programmable system with the diagnostics and LCD display, and controls for the multiple and variable speed, for precise flow, temperature and pressure measurements. As seen from the above, AO Smith solar water heaters with a great number of options are designed for different house sizes and users who are looking to maximize the solar free energy and contribute in protecting the environment.